Dense 01, originally uploaded by hc gilje. 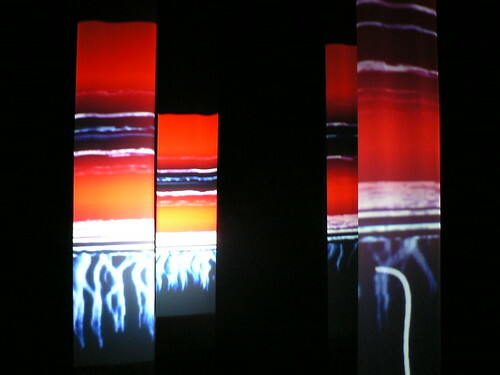 A doublesided videoprojection on six vertical strips of half transparent material at different depths in a blackbox space. One projection creates downward movement and the other a movement from side to side, thus creating a video weave on the projection surface where the projections overlap. The audio is generated by the changes in the video, one a dry chirping sound which pans with the horizontal movement of the video, the other is created by the downward movements of the other video, creating a very loud, deep sound resonating in the space. Moving around in the space is like walking inside a videomixer, perception of image and sound changes dramatically as you move inside the installation. The installation was comissioned for the opening of the 2006 season of Black Box Teater in Oslo, and was developed during my residency at Tesla, Berlin in autumn 2005.